Some moms approach motherhood with all the creativity and whimsy of an artist. And then there are moms like me. I approached motherhood with all the research and scrutiny of a scientist or a researcher. This is how I approach everything, so it no longer surprises my husband. When I was pregnant, I read everything from the Sears’ baby books and pregnancy books to Ina May Gaskin’s Spiritual Midwifery. I quickly realized that nothing was cut and dry. I had a million options in front of me. But ultimately, all decisions aside, Christian moms all have the same goal: To raise Christ-centered children. The problem is that there are many means to that end. We wade through the options and make our choices on a variety of issues, like baby-wearing, vaccinating, breastfeeding, early potty training, the family bed, strict schedules, attachment parenting, and the list continues. We draw lines in the sand, deciding which things will work best for our families. We are so thrilled when we find something that works for our family, and we love seeing children thrive. But somewhere along the way, these good things become THE thing. 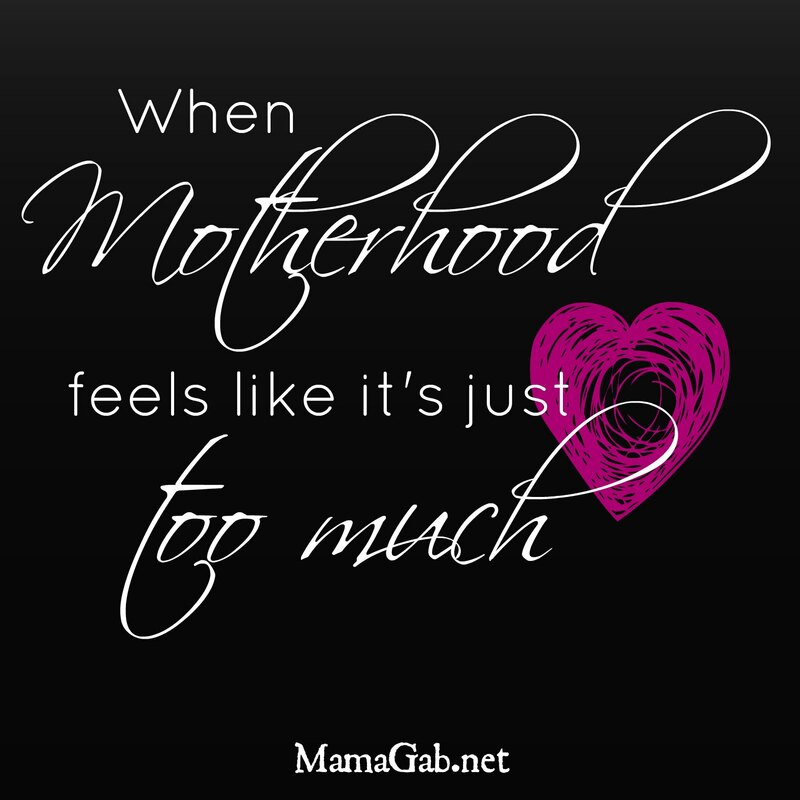 THE thing that makes one a good mom or bad. And the end goal is not what we focus on. It’s the small things that have become the big things to us. These things become the goals. They become our idols. We can worship at the throne of God, our creator & sustainer, or we can worship at the throne of organic food, smocked dresses, and gorgeous family photos. Only one of those things is worthy of our worship, and I’ll let you guess which one it is. How do we know they have become our idols? 1. We focus on these things. If it’s consuming too much of our time and our thoughts, then it’s probably an idol. 2. We think others measure our worth as a mom based on our success in one of these areas. We’ve talked about this. It speaks more about their hearts than it does ours. 3. Even worse, we let these things become our litmus test for other moms. We can let these parenting issues color the way we look at other moms, deciding if they’re a good mom or not based on if they follow the same methods that we do. This is always hurtful and in no way does it honor Christ. 4. And we also know they have become our idols when we aren’t willing to let them go when they’re just not working. If I would’ve known that my first baby was losing weight while I was troubleshooting breastfeeding, I would’ve definitely given her a bottle. But I didn’t know. And she kept losing weight because I was so focused on the idea of breastfeeding that I would’ve tried anything to make it work. And yes, we’re a success story because it all did work out–quickly–but had it not, I hope I would’ve had the courage to give that baby a bottle when the time came. I was making breastfeeding my idol. The smaller goal (breastfeeding) should never eclipse the big goal of raising healthy, Christ-centered children. And we don’t do this by idolizing breastfeeding, homeschooling, or any number of really good things. We don’t do this by idolizing motherhood, and thinking that our worth is defined by how skillful we are at getting our little ones on schedule, or wearing them in a sling, making babyfood, or protecting them from GMOs. No, the best way to raise Christ-centered children is to be Christ-centered mothers. Humble, Christ-centered, grace-giving, grace-receiving mothers. Join me, mamas, in laying the idols down. Looooovvvveee this!!!! From birthing, to feeding, to organic food, to parenting styles…we moms destroy ourselves (and others) with these idols. Awesome post! You’re right–it can be completely destructive! It’s a wonderful thing to make informed choices and to earnestly want to do the best thing for our kids, provided we don’t make it all about those things. It’s a fine line sometimes. Thanks so much, Tauna! I think it’s a common struggle. I love how your posts work well for any subject. I was reading this and thinking about things in my life. It’s not just mom that want to be perfect, it’s wives, single women, and girls. Perfect and idols are universal. Thank you for posting.